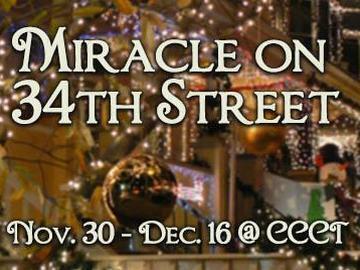 Clear Creek Community Theatre celebrates the holiday season with our Christmas production of Miracle on 34th Street. This is a tale that we all want to believe in – that creates a world we seem to desperately desire, free of the blatant commercialism that surrounds us, where love and decency and generosity of spirit are their own rewards. By chance Kris Kringle, an old man in a retirement home, gets a job working as Santa for Macy’s. Kris unleashes waves of good will with Macy’s customers and the commercial world of New York City by referring parents to other stores to find exactly the toy their child has asked for. Seen as deluded and dangerous by Macy’s vocational counselor, who plots to have Kris shanghaied to Bellevue Psychiatric Hospital. Kris ends up in a court competency hearing. Especially at stake is one little girl’s belief in Santa. Miracle on 34th Street is a heart warming holiday story. Its what we all want Christmas to be about. Clear Creek Community Theatre is located at 18091 Upper Bay Road in Nassau Bay.